Edelbrock Pro-Flo XT EFI System UNIVERSAL - MiataRoadster - Stay tuned with MiataRoadster! Edelbrock is known for complete performance packages that offer bolt-on performance ready to run right “out-of-the-box”. Pro-Flo XT is no exception. Each package includes a complete intake manifold assembled with fuel injectors, fuel rails and throttle body, electronic engine control unit (ECU), handheld calibration module, Mallory® distributor, complete pre-terminated two-piece efi harness, fuel pump, fuel filter, fuel hose, attaching hardware and software. The unique two-piece harness offers quick connection of the engine and chassis harness at the bulkhead on the firewall for easy connection and quick removal if needed. Edelbrock Pro-Flo XT is engineering at it’s finest with the introduction of a new line of EFI intake manifolds. The Pro-Flo XT intakes are engineered with a large plenum and long tapered runners to deliver maximum horsepower and a broad torque throughout the rpm range (1500-6500 rpm). A new front mount 90mm throttle body feeds the intake all the air it needs for maximum performance. Aesthetics were also a major consideration in the design, offering enthusiasts custom looks and choice of Satin aluminum or black powder coated finish with contrast machine. Featuring flash-programmable memory and full sequential injector firing this ECU was engineered by EFI Technology, a world leader in advanced electronic engine management. The flash memory allows multiple tuning options including Map-N (Speed Density) and Alpha-N (Speed Throttle). Base calibrations for common performance engine applications are included on the supplied CD and a base calibration is preloaded. Additional calibrations are available online at www.edelbrock.com. Custom calibrations can be created by the user and stored and restored when using the Pro-Flo XT PC based software. The system also supports closed loop fuel targets with narrow band O2 (included) or optional wide band O2 controller. Edelbrock pioneered “tuning on the fly” fuel injection systems with the introduction of the original Pro-Flo fuel injection in 1995, featuring Edelbrock’s exclusive Handheld Calibration Module. This unique handheld control unit is compact in size and plugs directly into your Pro-Flo XT ECU for easy access at anytime. The easy-to-read digital display allows you to adjust your fuel, ignition and rpm real-time without the use of a laptop computer. Up to three calibrations can be saved and restored. Initial calibration must be loaded with supplied software using a PC or laptop. If laptop tuning is what you desire the Pro-Flo XT gives you this option also. Pro-Flo XT allows unlimited custom tuning and enhanced tuning resolution of fuel and spark map via a laptop computer with the included Pro-Flo XT PC based software. You can tune, save and restore as many custom calibrations as you desire. 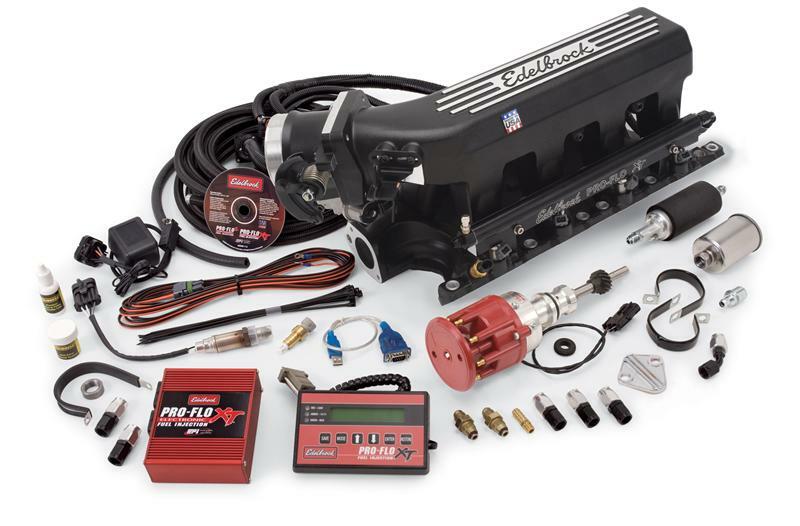 The Pro-Flo XT EFI system comes complete with OE quality harnesses and connectors for an easy installation. The unique two-piece harness offers quick connection of the engine and chassis harness at the bulkhead on the firewall for easy connection and quick removal if needed.